Did time get away from you? It's okay. You may be late with the birthday greetings, but all will be forgotten when the lucky lady sees this sweet belated birthday card. With its message of good tidings for the coming year and those striking pink daisies, your little slip-up will be a thing of the past, because she will be too busy looking forward to the future! Happy Belated Birthday - Wishing you a great year. 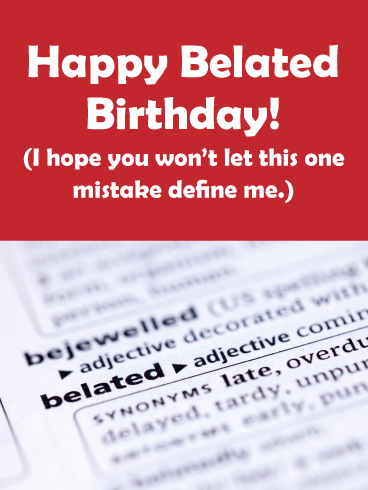 This belated birthday card gets right to the point by literally defining belated…even though you’re hoping he doesn’t define you by forgetting to reach out on the actual day! 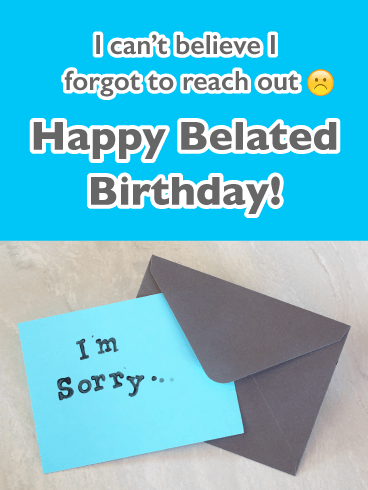 Both humorous and heartfelt, it’s the perfect greeting to send when you want to remind him that you do care and you’re full of regret for missing out. Just two words, “I’m sorry” say so much when you’ve missed his birthday. This handsome blue and grey card, with a note card and envelope, is a meaningful gesture when you want to let him know that you forgot to reach out and that you’re thinking of him and wishing him well. And even though it might be belated, it still comes from the heart. Did you forget a birthday? 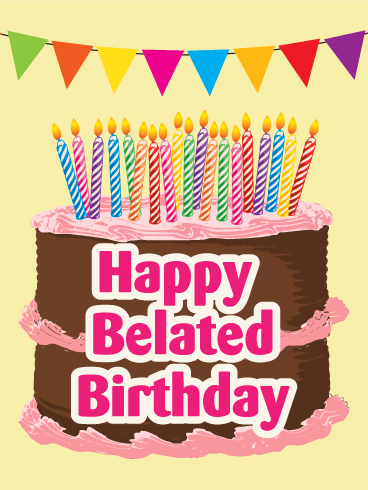 Do you need the perfect card to send a belated birthday message? Then you've found the right one! 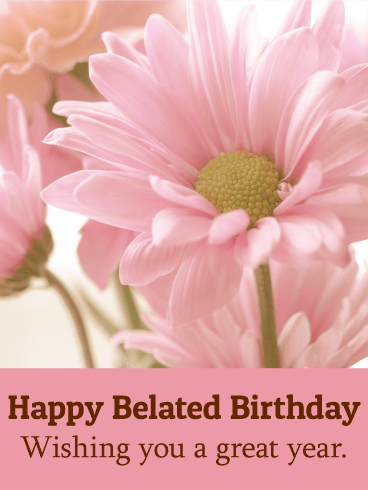 This Happy Belated Birthday card features a beautiful bouquet of pink, red, purple, and white flowers - the best way to apologize for your late birthday wishes! 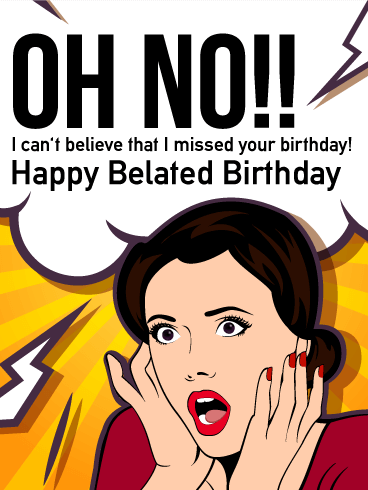 Show your loved one you care by sending this card before their birthday gets any farther away! 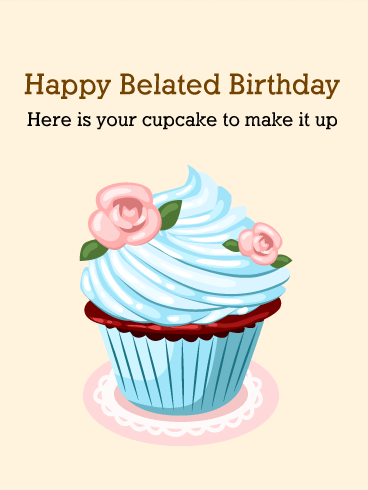 Maybe you couldn't be there for your birthday friend's special day, but you can be there in spirit with this cute cake card. It features a double decker chocolate cake decorated with rosy pink icing. A selection of rainbow candles and a matching banner top off the look, letting your friend know that even though you couldn't wish them well in time, you're still celebrating because they're worth still celebrating. This tasty cupcake looks good enough to eat! A mountain of blue icing on a yummy chocolate cake is just the treat to send for a belated birthday greeting. The pretty marzipan flowers and pink doily are so sweet they are sure to make up for your forgetfulness. You could have sworn you wrote it down or set a reminder, but whoops! Someone's birthday came and went, and you didn't get the chance to acknowledge it on the day. It's an easy mistake to make, especially when we're all so busy these days. And as our moms always told us, it's the thought that counts. So let a special someone know that they are in your thoughts and give them a smile with this quirky birthday card for belated wishes. So, oh no, you missed the special day. Solution? Sloths! 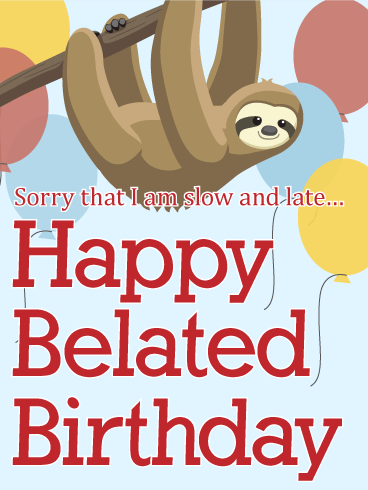 Once your friend or coworker or *gulp* your mom gets this belated birthday card, they'll be too busy thinking about all the adorable sloth they've seen to realize that you're a day late. Are you more than a day late? Don't worry, the cuteness of this sloth on this belated birthday card will make everyone smile! 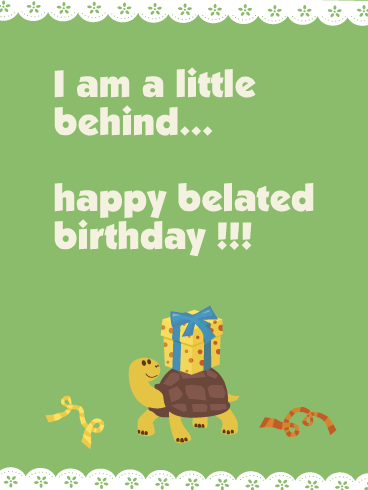 This cute turtle carries a polka-dot wrapped present to wish someone special a happy belated birthday. Pretty scalloped edges and the warm green make this a thoughtful belated birthday card to send, even if you are a little late! 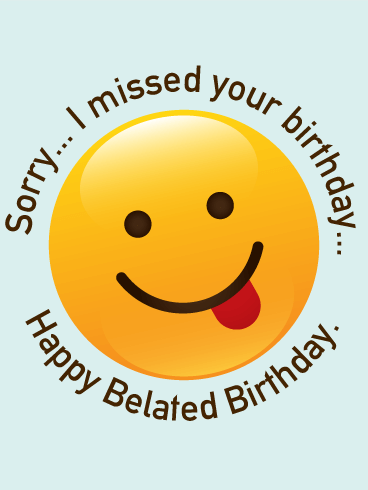 Don't delay, send a belated birthday greeting now. 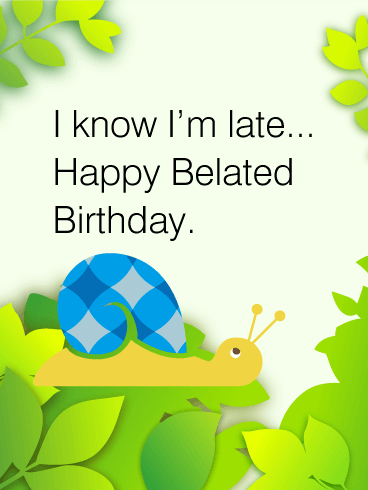 This cute, little snail knows he was a bit slow, but he still wants to wish a Happy Birthday to someone special. His belated birthday wishes will definitely be appreciated. Brighten someone's day and put a smile on their face with this fresh and fun belated card. Whoops! Did you mess up and miss someone's special day? Don't worry. Send a fun belated birthday card and all will be well. This silly emoji face with his tongue sticking out lets the receiver know you goofed, but you still care. Up, up and away! 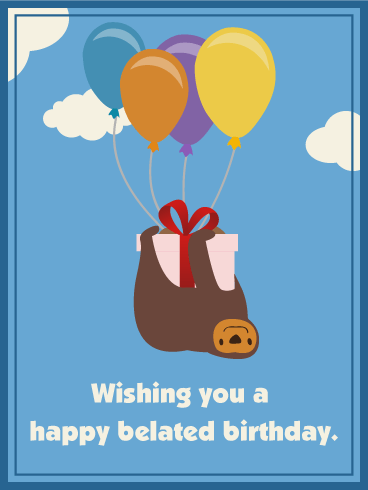 You may have been slow, but it's almost a good thing you forgot to send a birthday card because now this adorable sloth carries a belated birthday message on the strings of party balloons! Send this one-of-a-kind belated birthday card that is too cute to resist. There's still time to wish someone a happy birthday! 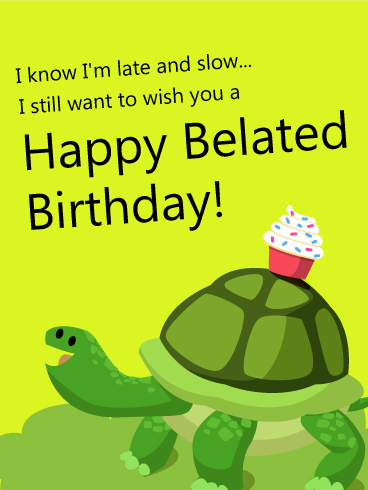 This thoughtful turtle brings a smile and a sprinkle cupcake just to say, "Happy Belated Birthday!" 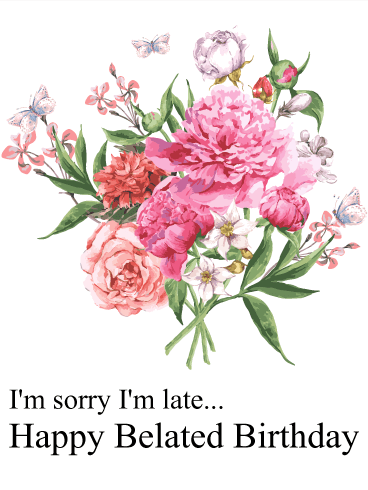 Send a charming belated birthday card and wish someone a happy day, even if you are a little late. They will definitely appreciate the thought.